Much to the relief of environmental advocates everywhere, Scott Pruitt resigned as head of the Environmental Protection Agency, effective July 6. It only took months of revelations about Pruitt’s behavior to force President Trump to acknowledge that Pruitt just might not be an asset to his administration. As Pruitt joins the ranks of Trump administration officials who have been fired or forced to resign, our government is beginning to look more like a season of The Celebrity Apprentice than an actual administration tasked with running a country. A lot of people were wondering what took President Trump so long to see the problems with Pruitt, given the constant media coverage of his ethical lapses and over-the-top expenditures of taxpayers’ money. But, as the Washington Post points out, the reason could be seen in Pruitt’s resignation letter. You may not have known this, but there’s an entire bureau dedicated to overseeing ethics in our government. 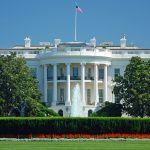 The mission of the Office of Government Ethics (OGE) is to provide leadership and oversight of the executive branch ethics program designed to prevent and resolve conflicts of interest. It works with nearly 5,000 ethics officials in more than 130 government agencies, selecting a Designated Agency Ethics Official, the employee with primary responsibility for directing the agency’s ethics program and coordinating with the OGE. “Your courage, steadfastness and resolute commitment to get results for the American people, both with regard to improved environmental outcomes as well as historical regulatory reform, is in fact occurring at an unprecedented pace and I thank you for the opportunity to serve you and the American people,” reads one paragraph. Are you feeling nauseated yet? The sheer brown-nosed obsequiousness in Pruitt’s letter tells us exactly why President Trump kept him so close, for so long. We all know how much the president loves to be surrounded by a cadre of yes-men who fawn over him with the star-struck eyes of middle school girls at a boy band concert. Pruitt blamed his resignation on “unrelenting attacks on me personally.” Most people blame his departure on his relentless corruption. First, there are relatively petty things like enlisting government employees to do menial tasks for him, using his position to get his wife a job, taking very expensive trips to foreign nations that would be really hard to relate to his position as head of the EPA, and pressing to fly first class or by private jet. Just because Pruitt is gone, don’t think things are going to get better for the beleaguered EPA—or for the environment—any time soon. EPA Deputy Administrator Andrew Wheeler will lead the agency while President Trump finds a new agency head. For years, Wheeler worked for Republican Senator James Inhofe of Oklahoma, one of America’s most infamous climate deniers. 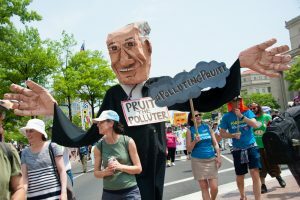 He is also connected to Robert E. Murray, who the Post describes as “an aggressive opponent of important air pollution rules that the Obama EPA tried to impose.” Pruitt began the attack on those regulations, and Wheeler is likely to continue Pruitt’s anti-environment agenda. The EPA is ready to commit what most environmental advocates would consider the exact opposite of the agency’s mission: proposing a comprehensive rollback of regulations that would require existing power plants to make large cuts in the amount of greenhouse gases they emit, substituting instead a call for minuscule changes at individual power plants. At this point, it seems that the Environmental Protection Agency’s name has become Newspeak for the Agency Trying to Destroy the Environment. That’s not going to change with Pruitt’s resignation.